Basically, what hasn't gone wrong in Rio? Ever since it was announced seven years ago that Rio de Janeiro would be home to the 2016 Olympics (the first South American city to host the games), the city has been plagued with problems related to the big gig. Rising crime rates, corruption, hazardous pollution, and mass protests from Brazil's citizens and its law enforcement has put everyone on edge. Oh, and then there's the Zika virus, NBD. 1. Fernando Echavarri and two other members of the Spanish sailing team were also robbed at gunpoint in Rio's Santa Teresa neighborhood, described as one of the city's "safer neighborhoods." According to reports, they were confronted by five teenagers who flashed pistols and made off with the Olympians' cellphones and other electronics. 2. And Australian paralympic sailor, Liesl Tesch, and the team's physiotherapist were also also robbed at gunpoint in broad daylight. Leisl's bike was stolen near her hotel by two men who then aimed a pistol at her and Australian Paralympic team physiotherapist Sarah Ross. Leisl told Australia's Nine Network that she was pushed to the ground as the two men rode off with her bike. 3. Adding to Team Australia's seemingly terrible luck, two Australian rowing coaches were robbed at knifepoint on Ipanema Beach less than 48 hours after the opening ceremony. The coaches were walking back to their hotel after attending the Australian team's informal opening ceremony, when they were confronted by two male teenagers, one of who pulled out a knife and demanded they hand over their money. They were physically unharmed after the incident, but Australian Olympic Committee spokesman Mike Tancred commented on the lack of security to the Sydney Morning Herald. "The host city has a responsibility to protect all the athletes and officials," he said. "They need to lift their game." Australia has pushed for more security measures with its team including banning athletes from popular beaches after dark, requiring them to travel in groups of three, and not being allowed to wear their team uniforms outside the Olympic village. 4. Journalists literally came under fire — twice. On day one of the Olympics, the roof of a media tent was pierced by a stray bullet that landed shockingly close to one of the media tables. And on day four, an official bus carrying journalists and traveling along Trans Olympic highwaywas hit by an unidentified object, shattering the vehicle's glass windows and injuring two people. It is still yet to be determined if this was from gunshots. Boss just told me I am off to the equestrian finals: as Rio Olympic execs still haven't confirmed origins of that stray military bullet. 5. Rio authorities blew up an Olympian's mom's luggage after suspecting it contained a bomb. Pamela Lloyd, the mom of U.S. Olympic volleyball player Carli Lloyd (not to be confused with the soccer player of the same name), left her suitcase at a Norwegian Cruise Line ship before hurrying off to watch her daughter's first volleyball match. However, when she returned to the ship, she was pulled aside by authorities who questioned and interrogated her about the contents of her suitcase before telling her they had blown it up. While some items were salvageable, most things were melted or had holes from the explosion. "Looking back at it, it was really bizarre," she told the New York Times. 6. A dead body was found near Maracanã Stadium on the night of the opening ceremony. The still-unidentified man was apparently shot to death in front of Rio State University, just mere blocks from where 75,000 people filled the stadium to watch the opening ceremony. 7. A Rio hospital was raided by more than 20 armed gunmen, who successfully freed an alleged drug kingpin being treated under police surveillance. 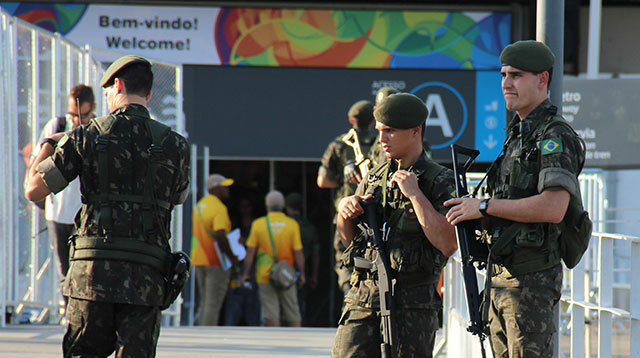 The raid took place at the Souza Aguiar hospital, which is one of the main emergency facilities for visitors at the Olympic Games and the closest hospital to Maracanã Stadium, where many events are taking place. To make matters worse, the alleged kingpin goes by the name "Fat Family." 8. This enormous television camera fell in Olympic Park and injured two women. For the most part the women seemed a little bruised up, but luckily OK.
9. Local policemen staged a strike at the Rio airport with signs that read "Welcome to Hell" to protest their severe wage cuts in the wake of Brazil's massive financial crisis. The signs went on to warn incoming tourists that authorities wouldn't be able to protect them from the city's rising crime, adding more fuel to security concerns. 10. Recent allegations that a severed arm and human corpse have been retrieved from Rio's Guanabara Bay have raised concerns of exposing Olympians, as well as spectators, to disease and illness. 11. And last, but certainly not least, all the chaos surrounding the Zika virus. Despite attempts by health professionals to delay the games due to its serious health risks, not to mention the threat of spreading the virus globally because Rio is drawing countless international visitors. More than 160,000 Brazilians have contracted the Zika virus, and Amir Attaran, a professor at the University of Ottawa, published this statement in the Harvard Public Health Review: "Mass migration into the heart of an outbreak is a public health no-brainer."